Dell F9541 / NF467 / H9122 / G9146 / MF666 / D981C / 0D981C / Y973C / 0Y973C / J105C tray / bracket / sled / carrier / assembly /caddy - Brand New for SAS / Serial SCSI / SATA 3.5" Hard Drives for Dell PowerEdge 840, 1900, 1950, 1950 III, 2900, 2900 III, 2950, 2950 III, 2970, 6900, 6950, R300, R900, R905, T300, T605 Servers and PowerVault MD1000, MD3000, NF100, NF500, NF600 Storage Arrays. 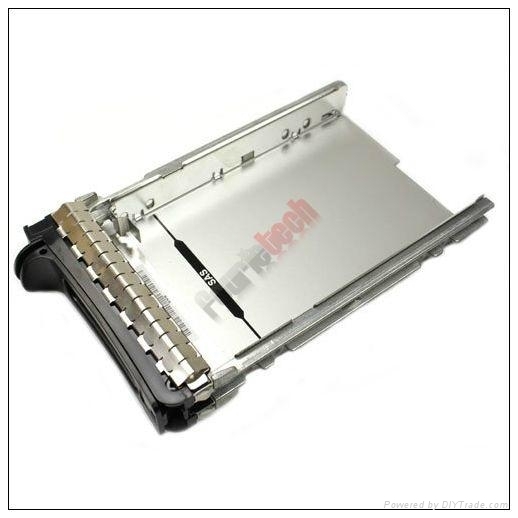 This tray is also compatible with the PowerVault MD1000 SCSI Storage Arrays when using SAS Hard Drives. SATA Hard Drives in the MD1000 SCSI Storage Arrays require the CC852 tray.